This article assumes you are using a Debian-based Linux machine (e.g. Ubuntu). This creates what is called an instrumented executable. It contains additional code which records the time spent in each function. If gprof does not appear to produce any output, it may be because of a bug in GCC versions 5 and 6. As a workout, provide the additional flag -no-pie to compilation and linking. Make sure there is only one hyphen at the start of the argument (NOT –no-pie). You can see above that approximately 60% of the time was spent calculating the Fibonacci sequence, while 30% was spent looping 100 million times. If this was a real life scenario, you could now start to optimise your code! If you find text hard to analyze, see the gprof2dot section below on how to create a visualization of the above results. gmon.out is only written to if your C/C++ program exits cleanly, that is, it either calls exit() or returns from main(). You must compile and link with the -ldl option for dlsym to be found. 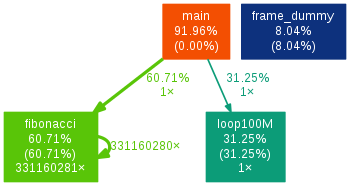 A profile of the execution time of the example code. Graph was created using gprof and the gprof2dot tool.